Street Views: 19 and 4 Suppl. 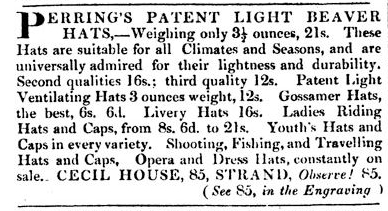 The first advertisement I found for John Perring is one in the Morning Post of 20 April 1822, although in an 1832 advertisement, he claims to have been a hatter for 18 years. 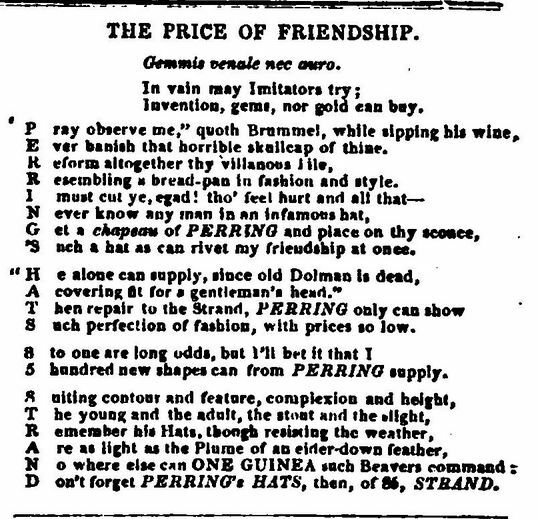 (1) In his 1822 advertisement, as indeed in all of his later advertisements, he offers silk and beaver hats; the silk hats with double covered edges, warranted water-proof for 17s and the fine light beaver hats from 18s to 21s, not to mention all sorts of other hats in various price ranges depending on quality. His address is given as 413 Strand, two doors from the Adelphi Theatre. 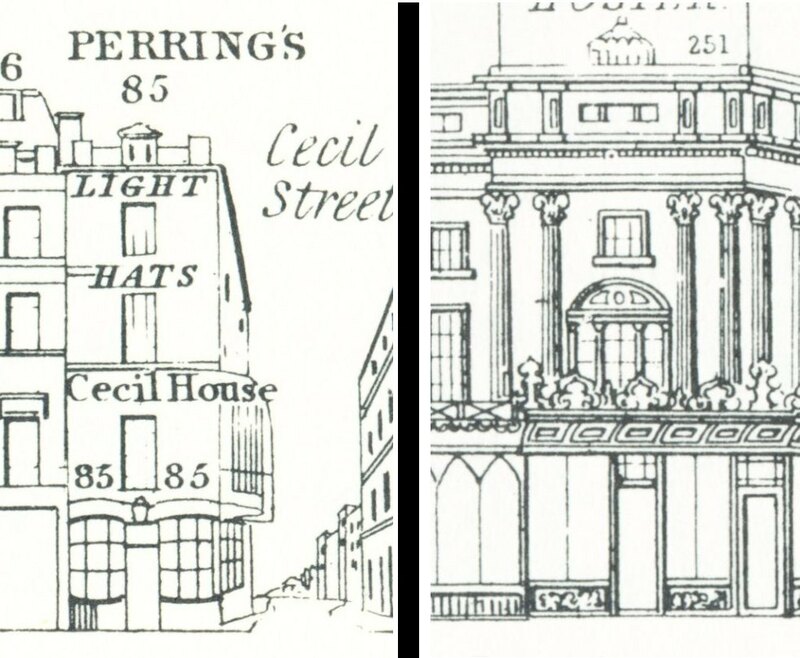 Another advertisement of 11 April 1827 still finds him at that address, but a month later he has moved his business to 85 Strand, corner of Cecil Street. (2) He later also refers to this address simply as Cecil House. 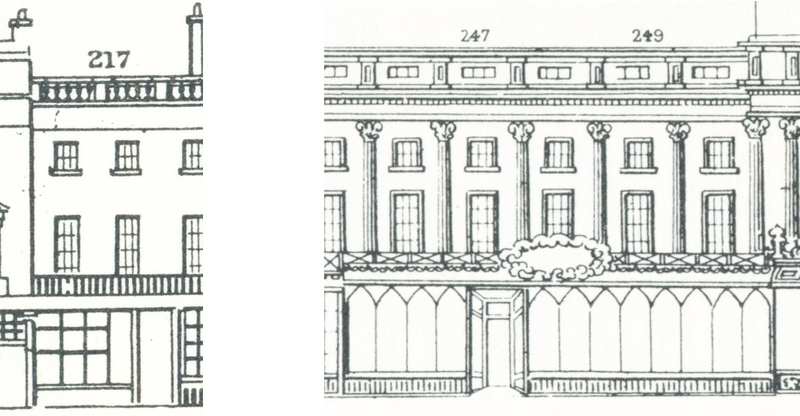 But Perring was not satisfied with just one shop and in 1830 he claims to have “four houses of business”. The April 1827 advertisement states that he has another shop at Hammersmith, although no exact address is given; an 1829 advertisement mentions the third shop at 124 Edgware Road. 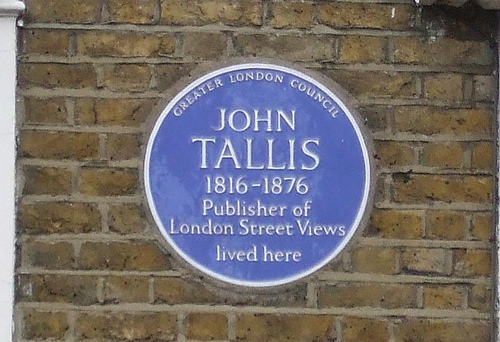 Although he already claims to have four shops in 1830, I could not find the fourth address, 251 Regent Street, until 1847 when the Supplements to Tallis’s Street Views came out. 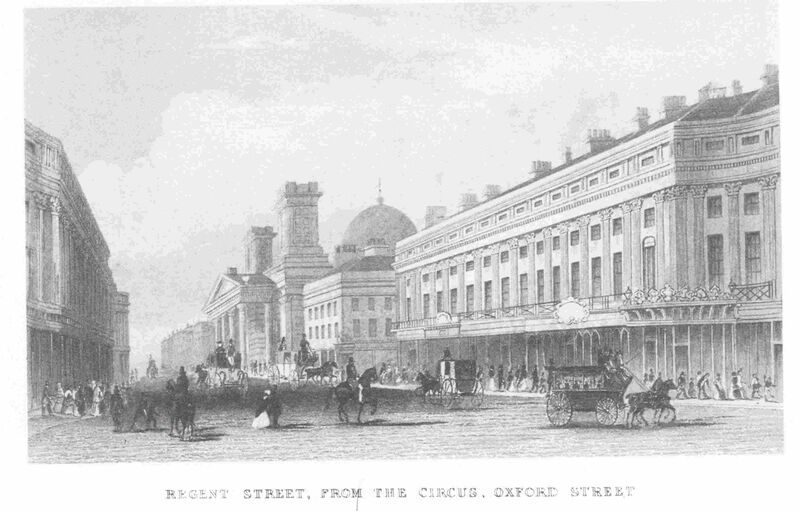 He was certainly not yet at Regent Street when the first lot of Street Views came out, as number 251 is then shared by Madame Lebas, a milliner and Thomas Day, a hatter. 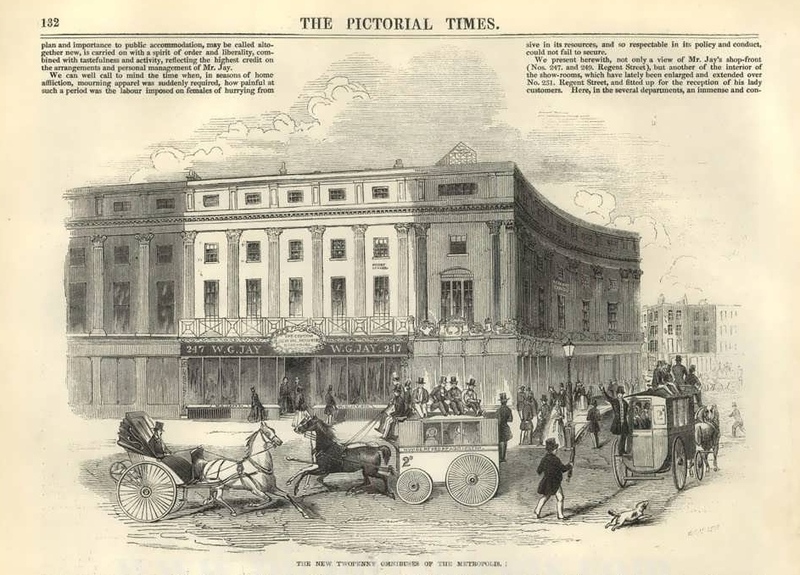 (3) Perring may very well have taken over the latter’s business sometime between 1839 and 1847. 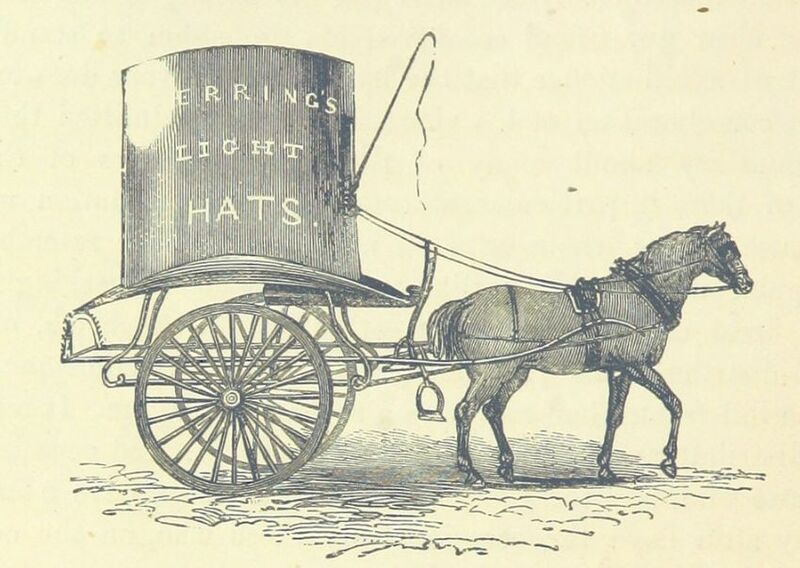 The earliest Perring advertisement for the Regent Street address can be found in Berrow’s Worcester Journal of 29 March 1849 where he tells his customers that “Perring’s patent light ventilating hats, so universally worn, [are] sent carriage free to any part of England”. Or traders could export them even further away if they wished as they are “suitable for all climates and seasons”. Perring claims to have invented an improvement in the beaver hat to make it a lot lighter, but his competitors did not all agree and claimed the same. And there were of course the sharp ones who tried to sell their own inferior product under a false name. Perring frequently warned about such practices in his advertisements as in the The Mirror of Literature, Amusement, and Instruction (vol. 18, 1831) where he states that “Since 1827, when Perring’s patent extra light beaver hats were first invented and introduced to public notice, hundreds in the trade have begun to talk about weight, professing the greatest absurdities, to the prejudice of the inventor”. In the 1832 advertisement mentioned in the first paragraph, he even speaks of copyists that “have sprung up like mushrooms”. Fakes were shipped abroad, so Perring “respectfully informs the nobility, gentry, and public generally, that none are of his make unless purchased at no. 85, Strand, with the name printed at the bottom of the lining”. How anyone abroad was to recognise a fake from a true Perring hat remains a mystery. A name in the lining can just as easily be faked as the whole hat. Information on how to make beaver hats can be found here. Consider for example that great Hat seven-feet high, which now perambulates London Street; which my Friend Sauerteig regarded justly as one of our English notabilities; “the topmost point as yet,” said he, “would it were your culminating and returning point, to which English Puffery has been observed to reach!”- the Hatter in the Strand of London, instead of making better felt-hats than another, mounts a huge lath-and-plaster Hat, seven-feet high, upon wheels; sends a man to drive it trough the streets; hoping to be saved thereby. 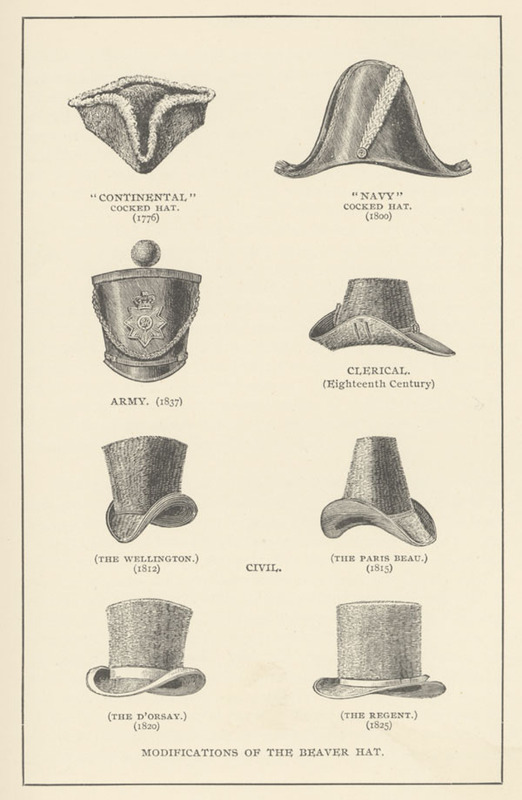 He has not attempted to make better hats, as he was appointed by the Universe to do, and as with this ingenuity of has he could very probably have done; but his whole industry is turned to persuade us that he has made such! Perring’s hat on a cart did not convince everyone that that was the way advertising should go, but it certainly got him attention. His name appeared in the newspaper in quite a different way as well. In 1837, James Greenacre was sentenced to death for murdering Hannah Brown. Greenacre had promised to marry Mrs Brown, but just before the wedding he murdered her and cut her into bits; most of the body parts were found near the Edgware Road, but the head was fished out of Regent Canal. Greenacre’s mistress, Sarah Gale, turned out to have been Hannah’s niece and goddaughter; she was sentenced to transportation for helping him dispose of the body. You can read the whole court case with all the gory details here. You may well wonder what this story has to do with hatter Perring, but it turned out that Hannah Brown, before coming to live at Union Street where she was murdered, had been living for about two years at the Strand as Perring’s housekeeper and this fact was reported in the papers. Unfortunately, the first census of 1841 is too late to be of any use in establishing the truth about her employment at Perring’s, but he remained a bachelor all his life, so he probably had a housekeeper. The 1841 census for 85 Strand only shows George Haule, apprentice hat maker, Thomas Pennell, errand boy, and Ann Reeve, a 40-year old servant (presumably the housekeeper after Hannah Brown), resident there. Where Perring himself was is unclear. We do find him at home, however, in the next census of 1851. Also there are Samuel and Susan Date, husband and wife who serve as shopman and housekeeper, and a number of visitors. The census gives Hammersmith as the place of birth for Perring and his age as 50. In 1852, Perring is still listed in the Post Office Directory, but I have found no record of him after that year. Perring was not satisfied with just being a hatter. In 1829, he paid ‘game duty’ for a certificate that allowed him to “use any dog, gun, net, or other engine, for the purpose of taking or killing any game whatever, or any woodcock, snipe, quail, or landrail, or any conies, in any part of Great Britain”. (4) Whether he actually hunted has not come to light, but at least he had a licence to do so. In 1851, he took 200 shares in the Northern and Southern Connecting Railway(5) and in 1842 a patent was given to “John Perring, of Cecil House, 85, Strand, in the city of Westminster, hat manufacturer, for improvements in wood paving, – partly communicated by a foreigner residing abroad”. (6) The improvements were to do with the way the wood blocks were cut and pegged together with an elastic substance between the blocks. The text of the patent with the explanation of what these improvements involved can be read online here. I am sorry about the quality of the illustration above, but Google has not produced a better one. (1) Shown in J. Strachan, Advertising and Satirical Culture in the Romantic Period (2007), p. 37. Unfortunately, no source is given for the advertisement. (2) Morning Chronicle, 11 April 1827. Observer, 8 July 1827. (3) In the 1847 Supplement, Tallis accidentally writes the name of J. Leonard over number 251, but he occupied number 249. (4) Act 48 Geo. 3. cap. 55 of 1 June 1808. Morning Post, 7 September 1829. (5) Daily News, 27 June 1851. (6) W. Newton The London Journal of Arts and Sciences, vol. 22 (1843), pp. 103-106. Jay’s started out moderately at number 217 Regent Street (see elevation at the top of this post on the left) as ‘Shawl warehouse’, but expansion soon followed. 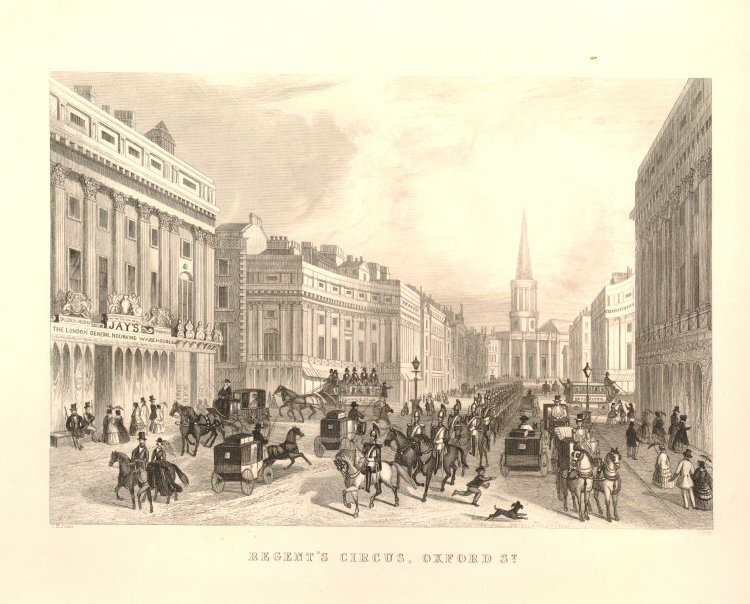 In 1847 when the Supplement to the Street Views came out, Jay’s were still ‘only’ occupying numbers 247 and 249, but they eventually spread out over almost the whole section of shops on the west side of Regent Street between Princess Street and Oxford Street, from 243 to 251, just missing out on numbers 239 and 241. The shop was frequently depicted in advertisements and other illustrations. 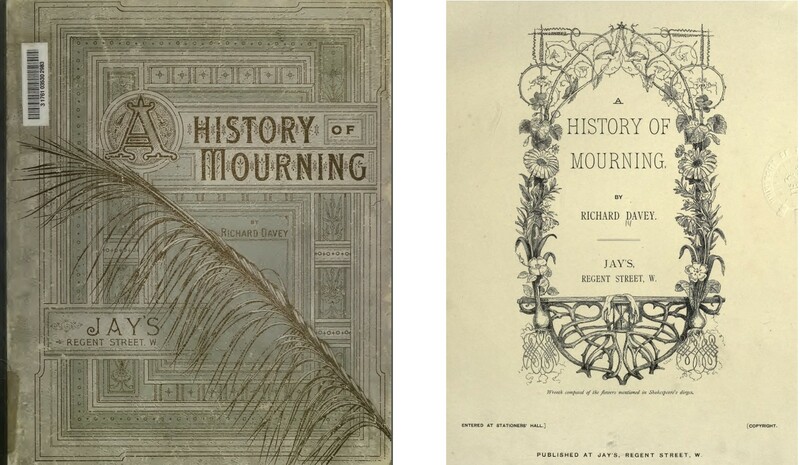 Jay commissioned Richard Davey to write A History of Mourning (online here) in which he tells us that “funeral ceremonies and rites are of the most remote antiquity” The ancient Egyptians apparently chose yellow as the colour of their garments when in mourning, but our custom of wearing black comes from the Greeks. Davey not only writes about the clothes, but also about the funerals themselves, the processions and customs in various countries. He says, for instance, that it was the custom in Norfolk until the beginning of the nineteenth century to give the mourners “black gloves, scarves, and bunches of herbs”. Remember that Pepys frequently received a mourning ring when attending a funeral. 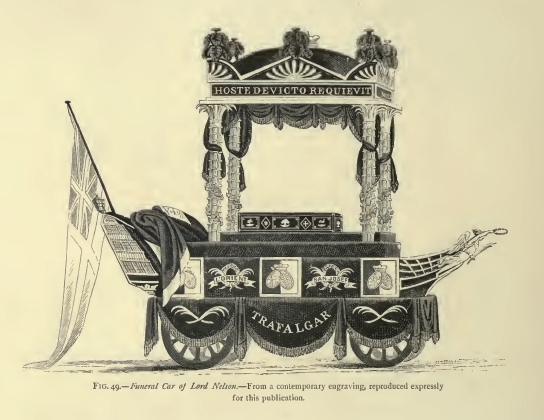 Very rarely does Davey touch upon the funeral of ordinary people; it is all about royalty, popes, and famous people like Lord Nelson. But that is not surprising; after all, Jay’s made a living out of selling people things they did not really need, but thought they were obliged to buy to keep up appearances. Their great example of course being Queen Victoria who elevated the art of mourning to a new height. And if you are not exactly sure what the regulations are, Davey will tell you who is responsible for the etiquette, for instance: “The order for Court mourning to be observed for the death of a foreign sovereign is issued by the Foreign Office, and transmitted thence to the Lord Chamberlain”. The notices issued about the mourning are very detailed and specify exactly at what time one is supposed to wear black and when dark grey and whether the gloves should be black or white. Of course, as the instigator of Davey’s book, Jay’s did not neglect to put themselves in as favourable light as possible, although I would take the phrase “at the very smallest modicum of profit” with a pinch of salt. 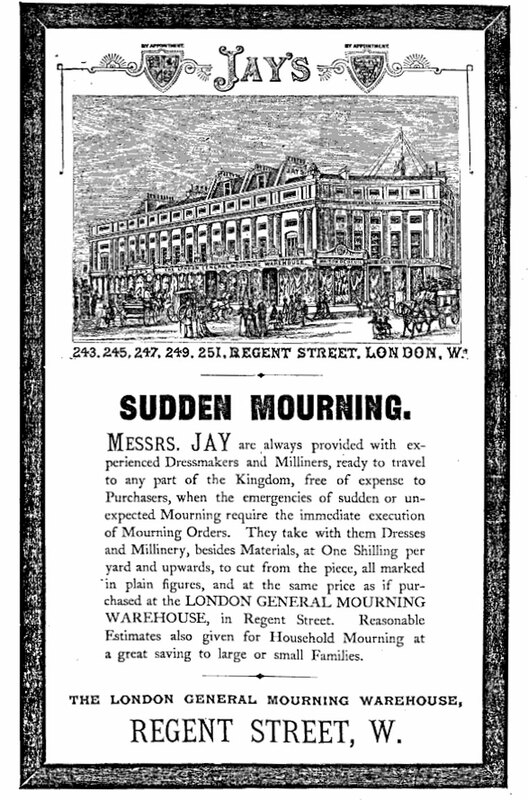 Such developments [that is: the percolation to England of Continental ideas in mourning fashion] could scarcely be exhibited in a more marked manner than in Jay’s London General Mourning Warehouse, Regent Street, an establishment which dates from the year 1841, and which during that period has never ceased to increase its resources and to complete its organisation, until it has become, of its kind, a mart unique both for the quality and the nature of its attributes. Of late years the business and enterprise of this firm has enormously increased, and it includes not only all that it necessary for mourning, but also departments devoted to dresses of a more general description, although the colours are confined to such as could be worn for either full or half mourning. Black silks, however, are pre-eminently a speciality of this house, and the Continental journals frequently announce that “la maison Jay de Londres a fait de forts achats.” Their system is one from which they never swerve. It is to buy the commodity direct from the manufacturers, and to supply it to their patrons at the very smallest modicum of profit compatible with the legitimate course of trade. The materials for mourning costumes must always virtually remain unchangeable, and few additions can be made to the lists of silks, crapes, paramattas, cashmeres, grenadines, and tulles as fabrics. They and their modifications must be ever in fashion so long as it continues fashionable to wear mourning at all; but fashion in design, construction, and embellishment may be said to change, not only every month, but well-nigh every week. The fame of a great house of business like this rests more upon its integrity and the expedition with which commands are executed than anything else. To secure the very best goods, and to have them made up in the best taste and in the latest fashion, is one of the principal aims of the firm, which is not unmindful of legitimate economy. For this purpose, every season competent buyers visit the principal silk marts of Europe, such as Lyons, Genoa, and Milan for the purpose of purchasing all that is best in quality and pattern. 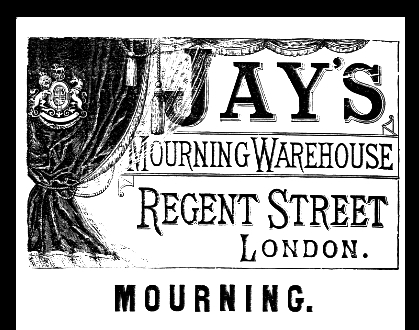 Fashion obviously played a large role in the success of warehouses such as Jay’s. Mourners, despite their grief, still had to keep up with the latest fashion and could certainly not be seen in last year’s model (or even last week’s model if Davey’s eulogy on Jay is to be believed). No mention of the pecuniary value to Jay if fashion changed as often as it did, but it certainly did them no harm. 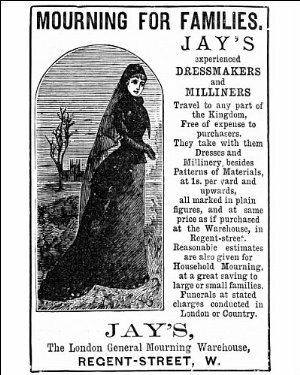 So, ever changing models and material were available in the draper shops, but Jay realised that it was not just clothes the customers were after; they needed ribbons, hats, rings, gloves, hand bags, shoes, flowers, drapery for the house, etc, etc. and he supplied it all, not just for the ladies, but for the whole family. (3) The British Library has a small booklet, Modes des Mantelets (Shelf-mark: C.193.a.275) which was published by Jay for the convenience of customers “at a greater distance from town” and which contains eight lithographed plates in colour of the latest fashion in mantelets and cloaks. For instance: Plate 1, “La Mantelette Sultane de Madame Popelin”, or Plate 6, “La Mantelet Clementine”. 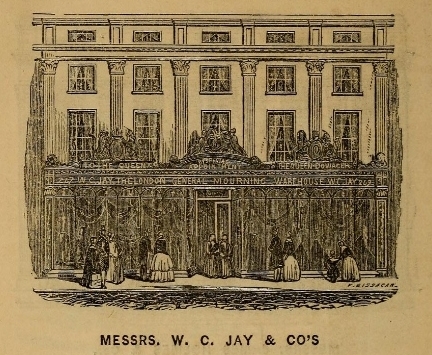 Unfortunately, no date is given, but Jay announces in the booklet that he has just taken over the adjoining premises of number 251 in which he “will forthwith open another suite of shew[sic] rooms, amply stored with the various products comprised in his extensive stock, from the principal manufacturing houses, both of London and Paris”. Jay’s was started by William Chickall Jay, who was born around 1811 in Cavendish, Suffolk. He died 27 April 1888 and his probate record showed that he was worth over £100,000. His only son Thomas Simpson Jay was one of the executors. (2) The census records also show several daughters for William and his wife Mathilda Wylie Simpson (they had married in 1838), but no other sons. William Chickall’s grave at Kensall Green, however, shows the names of three sons who were born to the couple but who died very young. The 1851 census is particularly revealing about the size of the business. William, his wife and the surviving five children (Thomas, Elizabeth, Ellen, Ada and Eugene) live above the shop (listed as being at numbers 247 and 249), but also living there are 20 employees, ranging from one of the porters, Henry Jones (21 years old), to a dressmaker, Henrietta Champ (18), and from a milliner, Mary Dixon (widow, 25), to the housekeeper, Sarah Martens (38). It is most likely that more employees came in on a daily basis, but the census just shows those living above the shop. 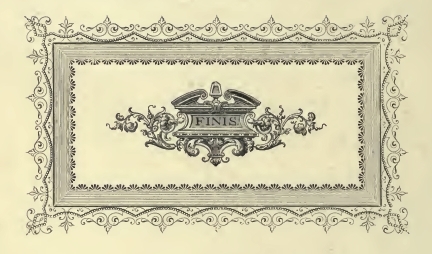 (1) Advertisement in Bradshaw’s Illustrated Handbook to France, n.d.
(2) England & Wales, National Probate Calendar (Index of Wills and Administrations), 1888. (3) See for more funeralia http://www.ephemera-society.org.uk/articles/funeralia.html and http://vichist.blogspot.nl/2008/06/victorian-funerals-and-mourning.html?m=1. 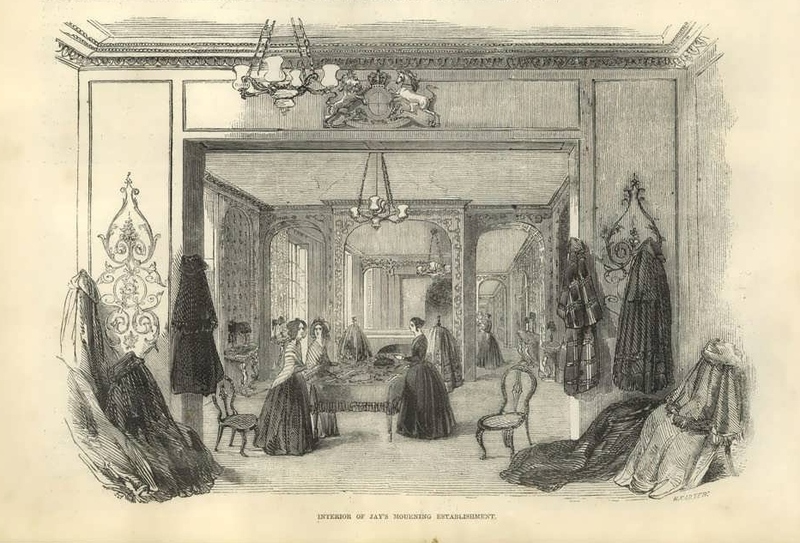 If you want to know more about mourning clothes in general, have a look at Daphne Nash’s Review of Death Becomes Her: A Century of Mourning Attire.